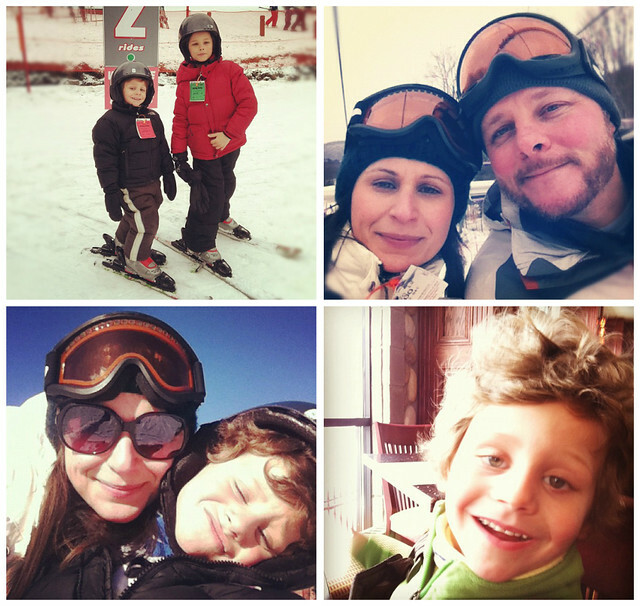 Elizabeth M Jacob: tips for skiing with kids. 1. It's better to be over prepared than under prepared. Last minute I decided to go out and buy the boys extra gloves and I'm so glad that I did. With a four and six year old gloves, socks and hats seem to disappear constantly. Somewhere during our trip we lost one glove and one hat. 2. Invest in one good pair of socks. The ski instructor actually recommended only one pair of thin good socks. He assured us the ski boots would keep their little feet warm enough and if you layer socks it could actually cut off circulation causing cold feet. On our last trip to Telluride I stocked up on Smart Wool socks for the kids that were half off. Best investment ever. Skiing burns a lot of energy and brings a hardy appetite. The boys munched on snacks that we put in their pockets while they rested. 4. Use the ski school. It can be a bit pricey but the instructors are good and know what they're doing. Most of them are teenagers and know how to connect with the little ones. We then took what they learned and worked with them later in the day. 5. Listen to your children. On the first day Jonas said he was done and didn't want to do ski school in the afternoon. We didn't want to push him because we were afraid he would be turned off to the whole experience. So we headed back to the hotel to swim and play. The second day he was ready to ski and do ski school all day long! I know, cheesy right? But have fun. Don't get caught up in stress or being overwhelmed. Bring some patience and have fun. We had a blast with the boys. We laughed so hard at times I still smile thinking about it. We enjoyed lunches and dinners out, we jumped on beds, we cuddled to movies, we acted silly and we drank tons of hot chocolates. I would love to hear any of your skiing stories. With or without kids! My husband and I are ski bums, and actually met at the resort we both worked at. We now live in a Cabin in Utah that is snowmobile/ski/snowshoe access only in the winter and are planning on getting our girl up on her tiny skis as soon as she stands! Skiing will just be a way of life for our kids. That said, these are great tips for when we actually venture to the resort for a day instead of just skiing here at home. that's fantastic!! i learned to ski when i was younger but then didn't until i met my hubbie. he is way better than i am, but i still enjoy it. i've never snowboarded but thought about picking it up?? we're doing ski school close to our home next year and i thought i could work on the snowboarding! These are great tips! I went skiing a few times but honestly hated it. I can't imagine doing it with kids, that has to be a whole other ball game! These are excellent tips! I went snowboarding a few periods but genuinely disliked it. I can't think about doing it with children, that has to be a whole other tennis ball game!